Clemantine Wamariya grew up the daughter of a wealthy businessman and a doting mother in Kigali, Rwanda but at age 6 she and her teenage sister, Claire, were sent to live with their grandmother to avoid the encroaching “conflict.” When the “conflict” came to their grandmother’s countryside farm the girls uprooted themselves again, spending the next 6 years are refugees across the African continent. The “conflict” Clemantine and Claire were fleeing was the 1994 Rwanda genocide. Claire’s solution to escaping all that was to make money, for bus fare, to get far away from this place. She took entrepreneurial reconnaissance walks every day, scouting for opportunities. One morning she left with my new romper, sold it and returned with soap, sugar, and rice. Claire, still a child herself, was a hustler who did her best to keep her little sister safe and fed by doing odd jobs, reselling items in marketplaces and marrying a CARE working who got them into Zaire. Unfortunately the war came to Zaire which displaced Clemantine, Claire and her husband’s family so they quickly became refugees again. During this time Claire’s husband, Rob, began to get abusive towards his young wife, who was now the mother of his daughter. Claire continue to hustle and make money for her growing family while her husband, no longer a CARE worker, spent the little money they had on a new girlfriend. Clemantine, who had been a kindergartner when the war broke out, spent her days mothering her newborn niece, Mariette. Unfortunately Claire, Clemantine and baby Mariette needed the presence of a man for a little protection from the lecherous men of the refugee camps so Claire didn’t try to leave her husband. Over the next few years the bedraggled family stayed in various camps in South Africa, Mozambique and Zambia before eventually getting approval to go to America. Reading The Girl Who Smiled Beads made me feel even more heartbroken for the families currently facing separation, confinement and who knows what other horrors in my home state. While there are many differences between the Wamariyas and the undocumented citizens in Texas there are striking similarities to the dismal living conditions to those who are country-less. 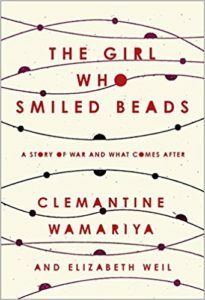 Clemantine focuses most of her attention to her time in Africa as well as the history of Rwanda and the discord between the Hutu and Tutsi tribes but she interjects those stories with snippets of her time in Chicago following her escape. She lived with an upper middle class family in a Chicago suburb during the school week so she could resume her long interrupted studies and then spent the weekends with Claire and her now three young children. As a highschooler Clemantine won a contest sponsored by Oprah that ran in tandem with an episode about Elie Wiesel’s Night. As a winner Clemantine, and Claire, got to attend a taping of the Oprah Winfrey Show where they were surprised by their parents and the younger siblings they had never met before. While Clemantine managed to escape the poverty and destruction of a war-torn country she still suffers from PTSD regarding the horrors she witnessed at such a young age. As an adult she has taken numerous roles and speaking engagements which have helped shine a light on the ongoing struggles in Africa. This is one of the most important books you could read this year. Share the post "“Nobody is who you think they are at first glance. We need to see beyond the projections we cast onto each other. Each of us is so much grander, more nuanced, and more extraordinary than anybody thinks, including ourselves.”"
This is such an important book! It really is impossible not to think of these poor children being ripped from their families and the lifelong damage our country is doing to them. What did you think of the whole Oprah thing? On one hand, Oprah did a lot to help Clemantine, opening doors for her and so on. On the other hand, ambushing her and her sister on TV — which seemed so wonderful at the time — now seems … I don’t know, thoughtless or selfish? Am I reading this wrong? I know Oprah meant well, but I guess no one considered the psychological/emotional impact on the two women. I agree that Oprah could probabaly have handled her big reveal in a more delicate manner. But I feel like nowadays big moments like this are commonplace on the daytime shows that have replaced Oprah so it seemed less overwhelming as a reader in the present day because I feel most people have come to expect this sort of thing on these types of shows.